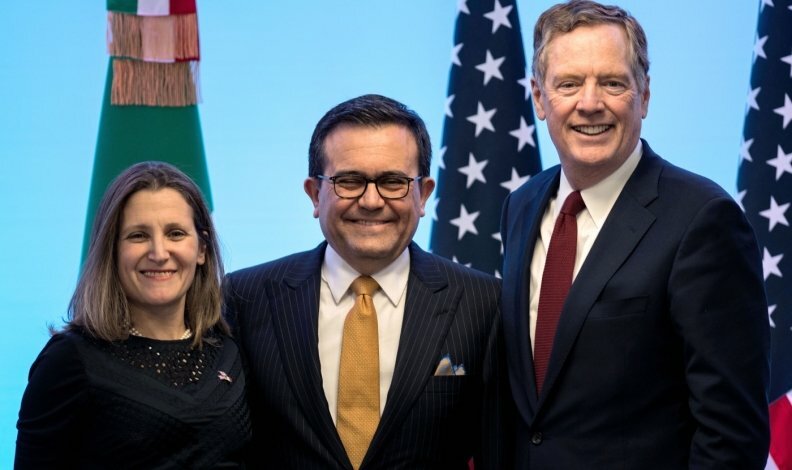 Canadian Foreign Affairs Minister Chrystia Freeland, Mexico's Economy Minister Idelfonso Guajardo, and U.S. Trade Representative Robert Lighthizer on March 5. Cabinet-level negotiators from the three NAFTA nations meet again in Washington this week to attempt a breakthrough on the trade deal in May. It won’t be easy with automotive issues still looming large. Several contentious issues remain unresolved after more than eight months of talks between Canada, the United States and Mexico to renegotiate the North American Free Trade Agreement. Discussions last took place in late April and will resume today, with U.S. Trade Representative Robert Lighthizer expected to host Mexico’s Economy Minister Ildefonso Guajardo and Canadian Foreign Affairs Minister Chrystia Freeland. Despite insisting that he wants to secure a deal in the coming weeks, Lighthizer hasn’t shown signs of softening on proposals that Canada and Mexico see as damaging to their interests. Guajardo and Freeland, meanwhile, have pledged not to back down. The topic of automobiles is likely to loom large. The United States has pushed for changes to the 24-year-old pact that would boost domestic auto manufacturing. Its proposals include tightening the so-called rules of origin, which govern how much regional content a car must have to enjoy NAFTA’s duty-free benefits, and requiring certain portions of a car to be built by people earning higher wages. At the last round of talks Mexico was outnumbered by the United States and Canada on auto wages, a battlefront that could upend the nation’s industry. Talks grew contentious, according to two people familiar with talks, although negotiators emerged striking a relatively upbeat public tone. The head of the Mexican automotive association, which represents companies with factories in Mexico, last week said the latest U.S. proposal is unworkable. He highlighted as problematic the demand for 40 per cent of the value of cars to be made by workers earning at least US$16 an hour. Mexican auto assembly workers generally make far less than that. Freeland said good progress has been made on the auto issues. Then again, Canada’s factory wages are closer to those of the United States than to Mexico. Freeland told reporters in a Saturday conference call that rules of origin will be at the top of the agenda this week. Divides remain on several other issues, including seasonal barriers to agriculture trade, U.S. efforts to open Canada’s dairy industry to foreign competition, government procurement, dispute resolution, and a clause that would terminate NAFTA after five years unless the nations agree to continue it. Despite the challenges, officials from the three countries have expressed some public optimism. As recently as last week, Mexico’s Deputy Economy Minister Juan Carlos Baker said he saw an 80 per cent chance for a deal this month, while cautioning that the ability to get there will depend on flexibility among the three nations. Stephen Kho, who spent nine years in a senior role at the U.S. Trade Representative’s office, said the ability to reach a deal in that time-frame is far from certain. “While you hear generally good vibes, it still wouldn’t be surprising if things fall apart,” said Kho, who’s now a partner at the law firm Akin Gump Strauss Hauer & Feld LLP. Lighthizer is pushing to get a NAFTA deal soon to meet deadlines that would allow the U.S. House and Senate to debate and approve an agreement this year. Waiting until 2019, when a new Congress takes over, “changes the whole way you have to kind of construct the deal,” he said last week. The U.S. official is fresh off a trip to Beijing, where two days of trade discussions ended with China agreeing to keep on talking, and little else. The United States asked China to reduce support for high-tech industries and help cut a trade deficit in goods that reached a record US$375 billion last year, according to a document seen by Bloomberg. As it parries with China, the U.S. is also threatening to impose tariffs on steel and aluminum imports from Canada and Mexico by June 1 if they can’t agree to a new NAFTA deal by then. Washington is negotiating tariff exemptions with other allies as well, including the European Union, as part of its strategy to protect domestic metal producers from foreign competition. This week’s NAFTA ministerial talks are scheduled to start today and could run as long as Wednesday, said a Canadian official familiar with the plans, speaking on condition of anonymity. Talks are held in private, although Freeland and Guajardo often provide updates to waiting reporters.